Gentle Warrior Flow – someone asked me if I could write down a flow we did in class. I struggle with this as my drawings are so awful and I ran out of time to do it ‘properly’ but here is an idea of what you can do! Hope it makes sense!! I love this pose and is it is so recognisable by everyone including all the none yogis. As it is an integral pose of Surya Namaskar I wanted to share a little of its idiosyncrasies so that you really do get the most from practicing it. We can move the body into a rough upside ‘V’ but often we are uncomfortable; but with a few gentle tweaks it can become a very light posture for the hands and shoulders. And there is always a version for those with really sore wrists. Have a go and let me know what you think! I love making up little sequences for myself…I often just lie on the floor or stand, and listen to what the body wants to do. Following a couple of days where I could not move without being in pain, I came up with this one, as it allowed me to be very gentle with myself, to feel into the areas of concern and to listen and adjust with the breath as I went. Have a go, interpret as you wish, but move mindfully with your breathing rhythm. 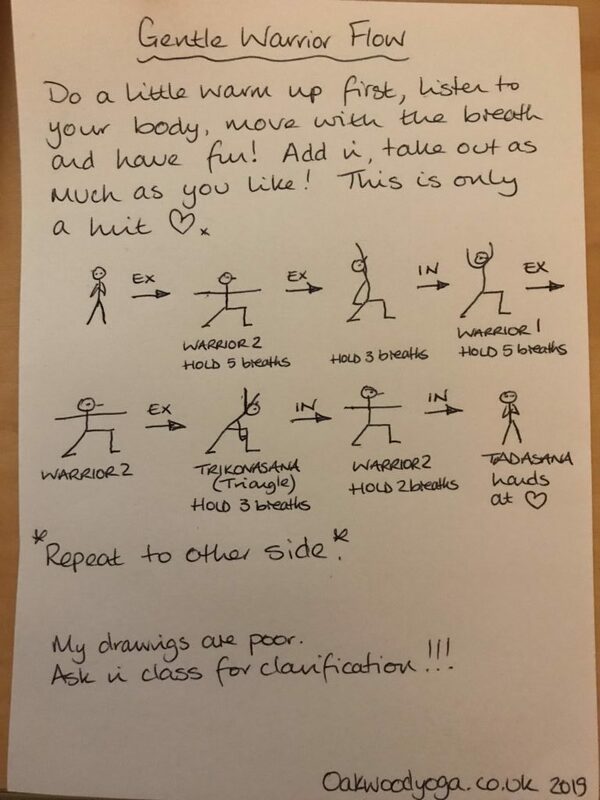 I was asked for a moon salutation practice and had forgotten I had done this! There are so many variations but this is a nice simple one I hope you enjoy. This is a collection of tapping practices I gathered from one of my teachers many years ago. It can be energising but it can equally make you tired so do be careful if you are already compromised in some way energy wise. But they are really helpful in keeping the lymph moving. This short sequence is beautiful to do really slowly staying in each pose for up to 10 breaths…but work up to that! Please do be careful and work within your own ability – if unsure get in touch. I love warrior poses and this is a short sequence you can do. If you are building up strength in the legs have a chair in front of you to help with balance…or do facing a wall or next to a wall. This is a video and is on You Tube…here’s the link. As many of you who come to class know, I am passionate about foot health. So this video is a little reminder of what else you can do for the feet other than moving them from the ankle in bed…before you even get up in the morning. It is on You Tube but here is the link. This is a wonderfully easy practice to do for yourself or to share with anyone who is unable to stand. It was devised by Pam Horton…a hugely experienced and lovely teacher I met during my training. This is a short practice you can do anytime to help keep body and mind calm and at ease. Do lying down and make sure you won’t be disturbed for 15 mins. This is a wonderful practice to work with and build up to. Do take care and really listen to your body whilst doing it. Start with 3 to 5 rounds of everything and adapt where you need to. Overview-of-the-qualities-of-the-Gunas...the three states of the mind. This sheet isn’t a practice but it does give you an idea of what they are all about and how you can alter what you do in your practice…perhaps! Hasta Utthanasana and Vrkasana – a video talking you through both postures – helping to bring a sense of deep calm and balance into the body. Jhulana Lurhakanasana – the yoga version of Rocking and Rolling! Bhagavad Gita Warrior for Fear We have done this in class many months ago, but I used on one of the Coachoya sessions and loved the reminder of how we really can make a difference to how we feel and think. Surya Namaskar – this is being demonstrated by my wonderful friend Janice. I love this practice and when I first started practicing yoga this was the first sequence I learnt…it took me a long time!